Sample of OPC Tunneller Setup. Based in Eagle Farm, Queensland, hExeis applies the theories and principles of mathematics and science to design computerised systems including hardware, networks, software and processes to solve novel engineering problems for operating assets such as machinery, buildings, and processing plants. hExeis uses OPC to establish communications between energy monitoring systems and building management systems. Using native DCOM presents a number of challenges related to system security, as well as DCOM interoperability between different versions of Microsoft Windows operating systems and computers in different Microsoft security domains and workgroups. OPC Tunneller either eliminates or significantly mitigates security risks and interoperability issues to dramatically reduce setup time and make computers more secure. The company recognised a significant opportunity to help oil, gas, mining and other resource companies comply with Australia's stringent greenhouse gas and energy control and reporting requirements. To do so, hExeis needs to integrate energy monitoring systems with its clients' existing building management systems -- that's where the DCOM challenges began. hExeis has always relied on OPC technology, but the company ran into authentication difficulties as it tried to configure DCOM connections across different domains. Security was also an issue, as DCOM requires that multiple ports be open through firewalls, effectively increasing the systems risk level for cyber-based attacks. Without the ability to predict how long it would take to establish DCOM connections, hExeis struggled with budgeting. The company was also concerned that at some point a client would simply refuse to allow a DCOM connection because of the vulnerabilities it opens in firewalls. When hExeis heard about OPC Tunneller, the company downloaded the free trial version from the MatrikonOPC website. "We had it up and running within an hour," said Conrad van Rooyen, Sales and Marketing Director, hExeis. Soon after, the company had made a firm commitment to the OPC Tunneller solution. With OPC Tunneller, setup -- which was once a weeks-long headache -- can now be scheduled for a single half-day. hExeis simply contacts the third-party server owner, gains permission to install and set up OPC Tunneller, and opens a single port in the client's firewall to establish the connection with the OPC server. The added security of the single port is a risk-mitigation measure that impresses both potential and existing clients. "For those familiar with DCOM, we are able to tell them that we now have an easier and more secure option -- that's a big selling point," said van Rooyen. OPC Tunneller has also reduced the need for ongoing support and maintenance. The addition of security patches or other minor changes frequently breaks OPC connections, but OPC Tunneller provides a far more stable connection that can also be restored much faster than standard DCOM configurations. "We now use OPC Tunneller exclusively," said van Rooyen. "It's easy to set up and it improves the security of our server and the third-party server. It is simply a better solution." MatrikonOPC Tunneller provides an effective way to communicate between networked computers. 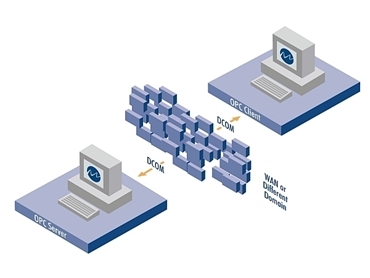 It does away with the challenges typically associated with DCOM configuration. No longer are different protocols, security settings or locations a factor when sharing data between computers. This is achieved by installing MatrikonOPC Tunneller on the OPC client and PC server nodes and then stipulating a computer name or IP address and the port setting. MatrikonOPC is a vendor neutral connectivity supplier and provides equipment data connectivity software based on the OPC standard.